In a large pot, combine the rice with four cups of water and a little salt. Bring the rice and water to a boil. Reduce to low heat, cover and gently simmer for a few hours. Stir the rice periodically to ensure that it does not stick to the bottom. Add more water if too much evaporates before the rice grains have dissolved enough to provide a good porridge consistency. Cook the rice three to four hours until you get a thick porridge consistency. As the porridge is finishing, prepare the remaining ingredients. In a large pan, sauté the garlic and ginger for about ten seconds in canola or gape-seed oil over medium heat. Once the garlic and ginger have released their flavors into the oil, but before they burn, add the chopped mushrooms. Sauté for about 5 minutes until the mushrooms release their water and it has practically evaporated from the pan. Add the tablespoon of soy sauce and cook a few more seconds until absorbed. Place the mushrooms in a covered bowl to keep warm. Without rinsing the pan, add the toasted sesame oil, cabbage and a pinch of salt to the same pan and sauté for 1 to 2 minutes. Allow the cabbage to begin to wilt, but avoid over-cooking it. 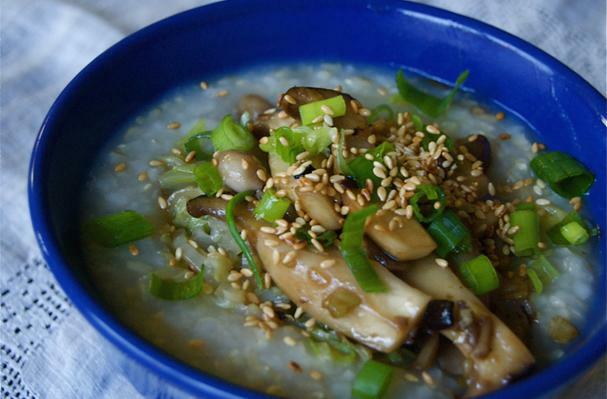 Serve by dividing the congee into bowls and topping it with the sautéed cabbage and mushrooms, chopped green onions and toasted sesame seeds. Provide soy sauce, rice vinegar and chili oil on the side for dressing the congee. Note: You can quickly make your own chili oil by warming some oil in a pan without allowing it to smoke, and adding fresh or dried crushed chilis to cook for a few minutes without burning. Once cooked, you can either strain out the chilis, or leave them in. The tricky part to this recipe is the rice. You will definitely need to plan ahead to make this meal because the brown rice takes about three to four hours of slow simmering for the individual grains to break down and form a good thick porridge. Of course, you could easily substitute white rice and cut the cooking time in half. You will also need to keep a close eye on the rice as it cooks, and stir it frequently. As the rice gets closer to being done, it begins to stick to the bottom of the pan and can easily burn, leaving the entire pot of congee tasting slightly charred.